As an independent contractor, your payment or “service fee” is calculated on a per-class basis (scheduled in 30-minute slots) and is composed of a minimum pay between $7-9 + incentives. 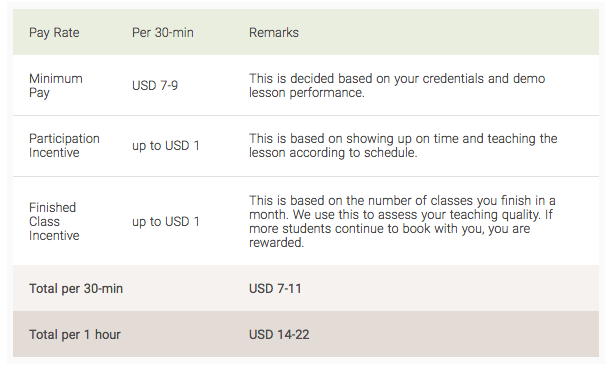 Your minimum pay will be determined by your demo class performance, while incentives are determined by your monthly class participation and completion. As independent contractors, for good or bad, you are responsible for your own taxes in accordance with individual tax jurisdictions or state laws. Absolutely, teachers are evaluated for raises at the point of renewal. VIPKid signs 6-month contracts with applicants who pass their screening process and you can work as much or as little as you’d like. Please inform VIPKid 2 weeks in advance if you intend to take an extended period of time off during your contract.